Ramsey Cascades is the tallest waterfall in the Great Smoky Mountains National Park. Hidden among a hardwood forest and spilling over a series of rocky boulders for over 100-feet, it's easily one of the crown jewels of the park—which, in a land as diverse and vast as the Smokies, is saying something. 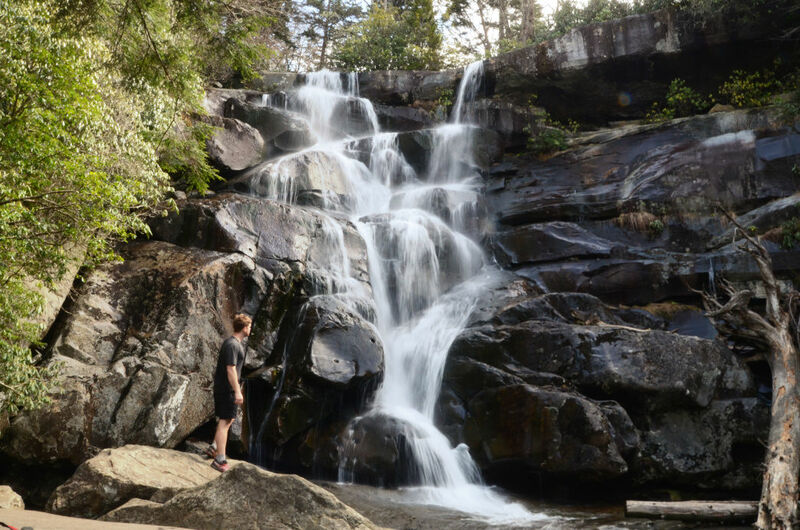 Beautiful and vigorous, the 4-mile hike (8-miles roundtrip) to the waterfall has an elevation gain of over 2,000' and is considered to be a moderately strenuous hike in difficulty with much of the strain coming in a final steep, rocky, and root-strewn mile. For those willing to climb and willing to spend 5-7 hours in the woods, this is one hike that should be on everyone's Smoky Mountain National Park bucket list. Along the way, visitors will be treated to lush, majestic forests, a babbling creek, and a scenic, tumbling waterfall as final reward. The Ramsey Cascades Trail is located in the Greenbrier section of the park in Tennessee. In order to get there, go approximately 6 miles from Gatlinburg on US 321, and take a right on Greenbrier Road at the Greenbrier entrance to the Great Smoky Mountains National Park. Follow this road for 3.2 miles, and then hang a left at a sign for Ramsay Cascades. You will cross a bridge and then in another 1.5 miles you will reach the parking lot and trailhead. (Lat:35.422 Lon:-83.2145). 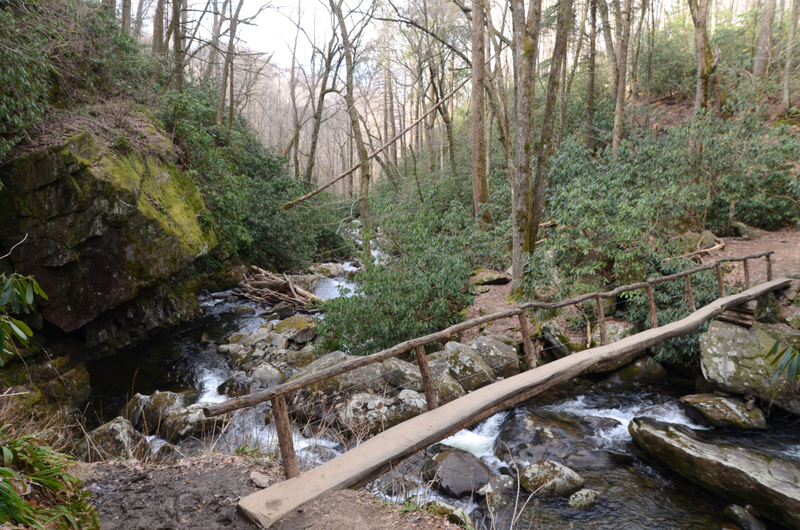 After parking, the hike starts-off running parallel to the Middle Prong of the Little Pigeon River for 1.5 miles along an abandoned logging road, which eventually funnels into a typically smooth Smoky Mountain singletrack trail. 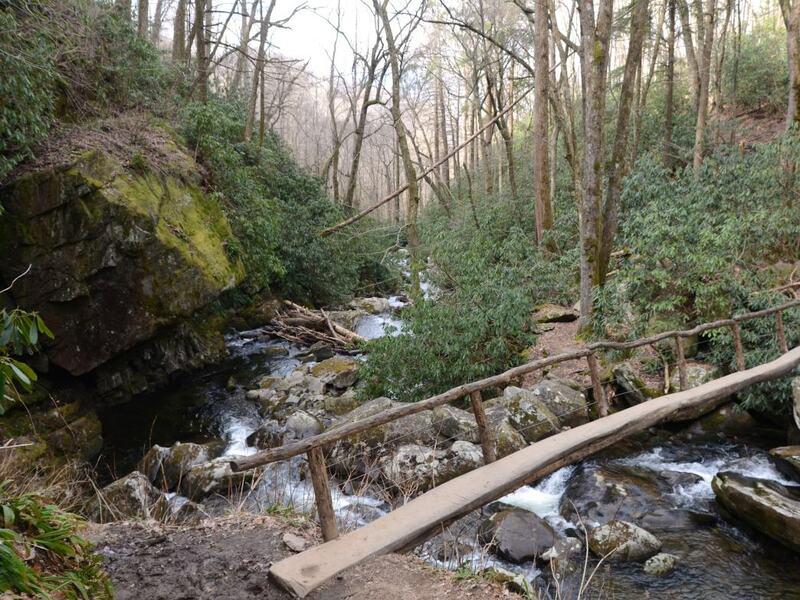 During the beginning of the hike, you'll see the 6,621-foot-tall Mount Guyot—the second highest peak in the Smokies, and the source of Ramsey Branch, the stream that flows over Ramsey Cascades. 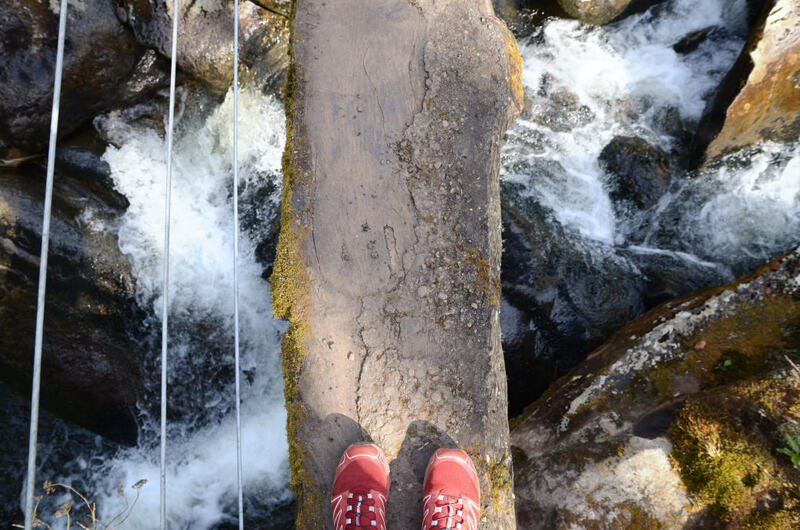 Along the way, you'll cross two very narrow one-log, single-handrail footbridges that can easily strike a sense of vertigo. 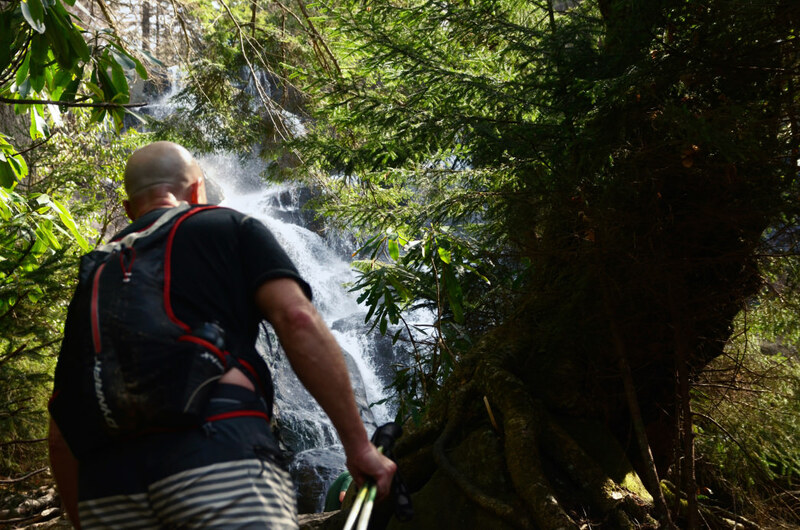 While the falls themselves are the ultimate reward, perhaps one of the biggest highlights along this trek is encountering the largest old-growth forest in the Smokies. 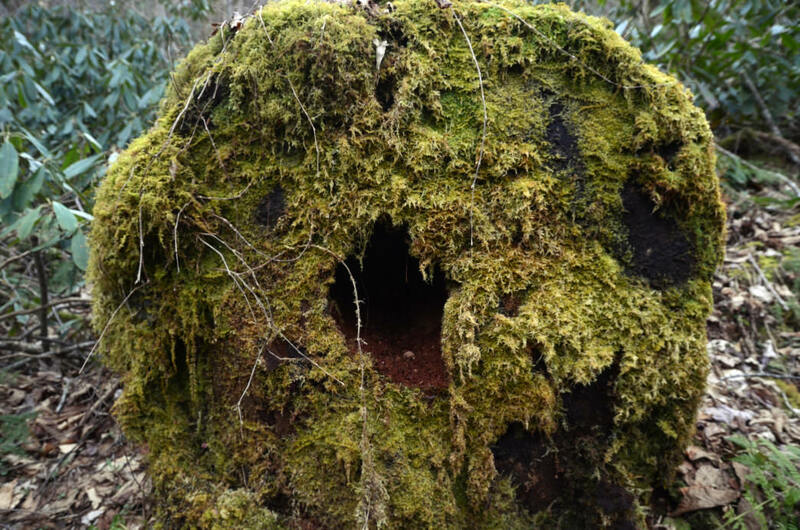 Whereas most of the land in the Smokies was once ravaged by logging companies back in the days before national park status was achieved, this particular forest somehow remained mostly untouched. 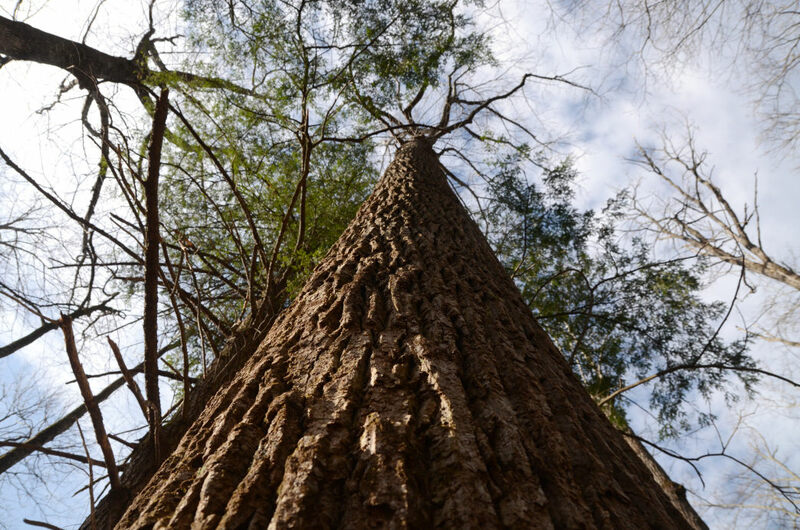 The result is that some of the largest and oldest trees in the park can be found along this trail. After 4-miles, the trail spouts hikers at the base of Ramsey Cascades. While it may be somewhat underwhelming to people who crave free-flowing waterfalls that steeply drop into plunge pools, this rather humble 100-foot cascade is actually quite a site to behold. And considering the novelty of being the highest falls in the park, it's a site that also comes with some bragging rights. At the base of the falls, there are signs that rightfully warn hikers to be careful and to use caution when gathering at the base of the falls. Fatal accidents have even occurred in the past. But if caution and common sense are exercised, this is a fantastic place for a picnic and a great reward after the somewhat strenuous hike up. The best way to experience this hike is by arriving early to beat the crowds in the parking lot and on the trails. After you make it to the falls, the hike back to the parking lot will be a breeze. And remember, pack it in and pack it out, and always Leave No Trace. Headed to Ramsey Cascades soon? Share your adventure with us by tagging #rootsrated. Lissa Ballinger: "Aspen Girl for Life"